The Thorens TD-535 professional turntable has been designed for discotheques, schools of the technical arts, and local radio stations. It employs direct drive to achieve rapid run-up times. A special suspension isolates the turntable against mechanical disturbances and acoustical feedback. The pitch control enables the speed to be varied by +-15%. The nominal rotation speeds of 33.33, 45 and 78rpm are regulated to quartz accuracy. Remote control may be added as an option for the start, stop and fader start functions. Any pickup cartridge with standard 1/2" mounting holes may be installed in the removable cartridge shell of the built in TP90 tonearm. 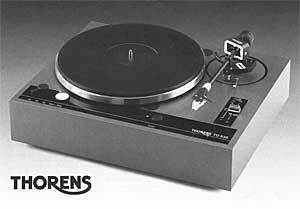 Thorens TD535 / TD-535 owners manual, service manuals and schematics are for reference only and the Vinyl Engine bears no responsibility for errors or other inaccuracies. The PDF files are provided under strict licence. Reproduction without prior permission or for financial gain is strictly prohibited. This website is not affiliated with or sponsored by Thorens.